Steve Jobs, co-founder, chairman and chief executive of Apple – one of the biggest, most profitable and most well known brands around the world. Unfortunately, yesterday, Steve Jobs has passed away, aged 56. Many believe that Apple is where it is because of this remarkable man, and say that without him, Apple would most probably have failed many years ago. Jobs was a one of the kind sort of man. He was for many years the face of Apple, as it seemed that nobody could ever really match his charisma, innovation or genius. When the firm was struggling in the 1990’s, Jobs returned, and saved the business, setting it on its path to become the second most widely used global operating system. In 2003 Jobs was diagnosed with pancreatic cancer. He took leave three times between 2003 and 2010, before finally resigning as CEO in August 2011, because of fears over his health. Jobs was one of the richest men in the world when he died, and was also one of the most well known and influential people of modern times. It is said that Apple’s marketing department used to consisted of Jobs looking in his mirror and asking himself what he wanted. 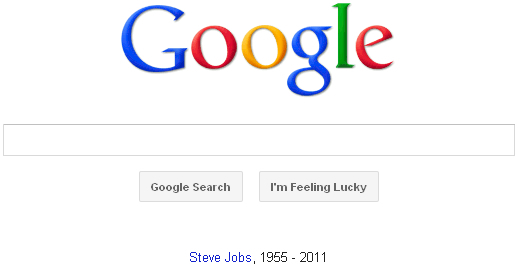 Apple’s competitor Google has paid tribute to Jobs on the home page of its global search engines. The link on Google’s home page leads to Apple’s homepage, which has a tribute to its maker, which takes up the entire page – just showing how important he was to the company. If you click on his picture, you are taken to a page which pay’s tribute to the legend in the classic Apple way – a clear, white page, with just a paragraph of text paying tribute to him. Today the world has lost a great man, and has been left many unanswered questions. Who will take over from Jobs? Will Apple now become just another technology giant, lacking in personality, eventually destined for decline and failure? He is an icon. 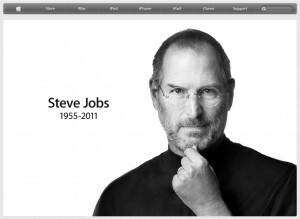 Steve Jobs will surely be remembered for many generations to come. R.I.P. Steve. A sad day indeed. My condolences to his family. In a way, we should all be glad because his suffering from cancer has already ended. I feel really grateful I got to live in this generation. RIP Steve. A very big loss for the whole world. Steve jobs, U will be greatly missed. He has really bring the revoluation in technology world.. I read it on FB so true about this legend. He was a great and genious man who really changed the world of technology and the innovation. I wonder what will happen to Apple after he passed away. I was never a big fan of Apple or its products for various reasons (although the first computer I ever used was an old Apple) but the story of Steve Jobs life was still inspiring to me. His Stanford speech is well worth watching if you haven’t seen it, I think it ranks up there with Randy Pausch’s Last Lecture video as one of the most inspirational things I’ve ever seen. YouTube those anytime you need a dose of inspiration to kick you in the pants and make you want to create something. It is sad that the world had lost Steve Job. He is one of the most influential man around where his speech can really teach people something. Not to forget, we will also miss the presentation that he had made on all the Apple products. He was very charismatic and funny wasn’t he Alan. Yes, this is indeed a great loss to the world. We all will remember you for your invaluable contribution to the technology world. RIP Steve. He is a true legend, inventor, genius and a great human. He has inspired so many lives and will be remembered. He is an icon to the next generation youth. Steve Jobs should be remembered for all the good he has done. What differs Steve Jobs to other genius or popular personalities in various industries is his goal in life. His goal to change the world not only for his own benefit but also for the benefit of all the people around the world. That makes sense why others who personally know him can totally feel a great lost in their lives. The goodness of his heart will truly be the greatest inspiration. He was always setting himself goals, and it it true that he was and I a sure still is, and inspiration to millions.